Enlisting the support of a recruiter can help you to launch a more effective job search. Finding the right recruiter who values you as a candidate and has connections with employers in your industry will be vital to your success with this strategy. Not all candidates will find that recruiters are willing to take on their case. In general, if you have strong credentials in a field with relatively high demand for workers, then you will find that recruiters are more receptive. In most cases, you should not rely solely on recruiters to conduct your job search but should employ a broad range of networking and job search strategies in your campaign. Actively reaching out to recruiters and positioning yourself so that recruiters will find you and appreciate your value are both important steps in the process. Recruiters, sometimes called search professionals or headhunters, work to find qualified candidates for employers. When you're job searching, a connection with a recruiter can help you find open jobs and secure an interview with an employer. Are you interested in working with a recruiter, but not sure how to go about finding one? There are sites you can use to search for and connect with recruiters in your career field, industry and/or location. There are several online directories that enable you to identify search firms by geographic area, functional specialty and/or industry. Recruiterly.com, Online Recruiters Directory, Oya's, Recommended Recruiter, and Searchfirm.com are all free services to help you to target recruiters relevant to your situation. Conducting a Google search with the name of your location and with keywords like "search firms," "executive recruiters" and "employment agencies" will provide you with a list of the websites of agencies in your area. For example, try "search firms in Atlanta." If you get too many listings, try a more targeted search like "Executive search firms for sales professionals in Atlanta." Publications like Forbes will also provide lists of agencies that they deem to provide high-quality services. One of the best ways to identify firms is to ask your contacts for recommendations based on their personal experience. Reach out discretely to fellow members of professional associations, LinkedIn contacts, college alumni, friends, neighbors and family members to inquire about their personal experience with recruiters. An added benefit of this strategy is that your contacts might speak to their recruiter and recommend that he or she work with you. You can search LinkedIn by keywords like "recruiter" or "search firms" to generate an extensive list of firms. You can "follow" them and see their job listings. Review the job listings in professional publications and notice which agencies are advertising to members of your group. 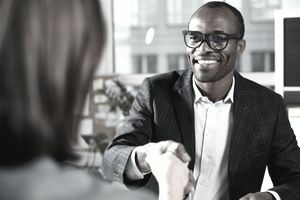 Some professional organizations allow recruiters to present at conferences or staff vendor tables which will provide an opportunity for you to connect with them on a personal level. Recruiters will seek out job seekers with marketable backgrounds and try to entice them to apply for positions with their client companies. LinkedIn is by far the most commonly used tool by recruiters to lure candidates. Developing a full and rich LinkedIn profile that includes endorsements, recommendations, work samples and a well-written summary of your skills and accomplishments can help you to attract willing recruiters. Recruiters also search databases of candidates on job boards. Placing a solid resume on sites like Indeed, Monster and niche sites in your field can make it more likely that you will be engaged by a recruiter. Maintaining a high profile in professional organizations will get you noticed by recruiters. Presenting at conferences, holding offices, and publishing can all increase your visibility. How can you choose a recruiter who will give you the most help with your job search? What should you look for when you're checking out recruiters? Here's advice on how to choose a recruiter including what you should ask the recruiter and what the recruiter will ask you. Selecting and partnering with a recruiter can become less anxiety provoking by following these suggestions. What is your recruiting specialty? Make sure this aligns with the type of job you are seeking. Can I speak with some of your clients to ask them about their experience? Here are tips and advice on finding a recruiter, standing out in a large candidate pool, building strategic relationships with recruiters, and how to make the best impression when working with a recruiter from career and recruiting experts. It's best to identify one or two recruiters that specialize in your field and start to build relationships with them. Job seekers make the mistake of submitting their resume to every recruiter, thinking it will maximize their chances. But recruiting agencies are typically all working within the same client pool, and if you have multiple agencies submitting your resume for a job, it puts the hiring company in a difficult situation of determining which agency to work with. In many cases, the hiring company may choose to pass over a candidate completely, rather than get into a debacle with competing agencies over who deserves the referral fee. When meeting with your recruiter, you should dress formally. Recruiters want to know that they are being represented in a professional way. Dressing formally every time reassures them of this fact. Do yourself a favor and establish strategic relationships with a select few agencies whom you feel confident are working with your best interest in mind, check in with them regularly, make sure they keep you in full disclosure about where they send your resume. A solid relationship with a good recruiter should be more of a partnership, a potential win-win for all parties involved. Sending a thank, you note to your recruiter means you'll do it for their client. Most recruiters will remind candidates to send a note post-interview, but doing it for the recruiter shows that you are responsible. Most importantly, they'll remember you, and that's important seeing as the average contingent search recruiter meets with five candidates a day—that's 20 per week. You need to stand out. Always be upfront with a recruiter and tell them if you cannot make an appointment, have other long-term goals, are waiting for a job offer you interviewed for last week. Recruiters are professionals and deserve the right to be treated as such. It will allow you to build a rapport with the recruiter and professional etiquette will make you stand out in a large pool of candidates as someone with integrity and professionalism both for now and in the future. Once you pick a recruiter, stay loyal. When you job hop, always let them know. It confirms that you had a good experience with them the first time, and re-brands your name in their brain. The more you go back to them, the faster they'll want to help you find a job. You performed well for them the first time, why wouldn't they want to help you again? Candidates that use recruiters for a second and third time tend to get placed almost double the time.